Mosquitoes are able to fly adeptly during a rainstorm as well as under clear skies, but how do they manage that feat? Since mosquitoes weigh 50 times less than raindrops, shouldn’t they be crushed by the rain? David Hu has discovered otherwise. Hu is an assistant professor of mechanical engineering and biology at the Georgia Institute of Technology, and in tandem with his graduate research assistant Andrew Dickerson, they have discovered that while mosquitoes do get hit by raindrops, they aren’t crushed. The researchers measured the impact forces of raindrops on both regular mosquitoes and mosquito duplicates, which were made out of small Styrofoam spheres. Ultra-high speed cameras captured the images of the resulting action. 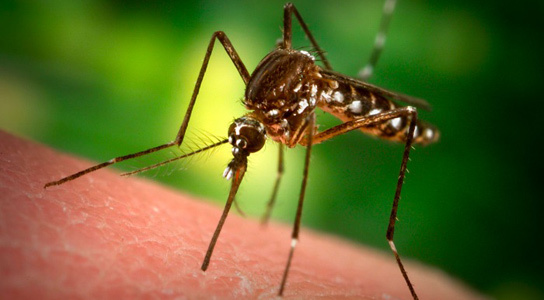 Mosquitoes fly too slowly to be able to detect and avoid colliding with raindrops, and while frontal impacts are infrequent, transverse impacts on the body and wings are a common occurrence. Instead of being crushed, their bodies get rotated around. Mosquitoes have low speed, mass, and inertia, so they aren’t damaged at all by the raindrops. The raindrops push the mosquitoes to the side. The drops might even bounce off completely, depending on the angle they hit. Be the first to comment on "How Mosquitoes Manage to Fly in the Rain"